We selected a brass flat-cut logo for these opulent office reception areas. 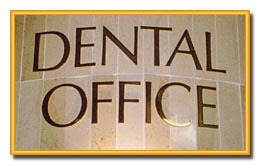 The Merrill Lynch design is pin mounted to the wall so it seems to "float" off the wall; The Dental Office design is mounted flat on the tile. A variety of metals and finishes are available, from dull to mirrored.